When it comes to dominance in women’s wrestling, especially on the level, look no further than Deonna Purrazzo. The two-time Super 8 ChickFight Tournament winner and currently the longest-reigning ECWA Women’s Champion had a tremendous year that saw her win four championships and win one tournament in a 12 month period. First, Deonna captured the Monster Factory Pro Wrestling Girls Championship from Miranda Vionette on January 9, 2016; only to lose it to Britt Baker 97 days later, leading up to Baker’s long run with the championship. Next came the Dynamite Championship Wrestling Women’s Championship, when Deonna defeated Chelsea Green for the vacant title in April of last year. After 262 days with the gold, she lost it to the longest reigning DCW Women’s Champion in the promotion’s history, Kacee Carlisle. The NYWC Starlet Championship was next, when she defeated Sammy Pickles and Brooke Danielle for the gold. She lost it a month later to Devil Doll, making this regard reign a short one. The one championship she has not lost is the ECWA Women’s Championship, making it eight successful title defenses in twelve months, ten title defenses since she won the championship at the 2015 Super 8 ChickFight Tournament. In the 2016 installment, she beat Tasha Steelz, Kiera Hogan and Karen Q to win the prestigious tournament for the second straight year, the first person in history to win back to back. It in-ring ability, charisma and work ethic to be a great independent talent, and Deonna has those qualities. She might be on the same level as Cheerleader Melissa and Santana Garrett in terms of in-ring success. 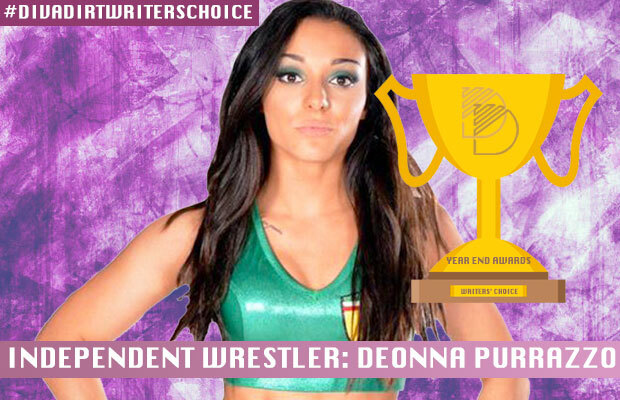 This year, Deonna Purrazzo is the epitome of success on the independent level.